Virginia Tech is hoping its Senior Day isn’t the last day of its football season. The Hokies (4-6, 3-4 Atlantic Coast Conference) will honor 12 players before Friday’s game against Virginia (7-4, 4-3), and they will be seeking their 15th consecutive victory against the Cavaliers. If they can manage that, they will play Marshall at Lane Stadium on Dec. 1 trying to qualify for their 26th consecutive bowl game. The first part doesn’t figure to be as easy as history might suggest. Virginia Tech brings a four-game losing streak into the game, and has lost the games by an average of 21 points. They’ve also had difficulty stopping the run, which could make Virginia an especially challenging opponent. The Cavaliers are led by dual-threat quarterback Bryce Perkins, who leads the ACC and ranks 17th nationally by being responsible for 170 points (19 passing touchdowns, nine rushing TDs and one 2-point conversion pass). He’s certainly caught the attention of the Hokies coaching staff. The Hokies quarterback is Ryan Willis, and he’s put up good numbers, too. Since replacing the injured Josh Jackson in the third game, he’s thrown for almost 2,000 yards with 17 touchdown passes and just five interceptions. Willis, a Kansas native, has been well informed of the importance of the rivalry. Virginia, in its third season under Bronco Mendenhall, lost 10-0 to the Hokies last season, and Mendenhall has made winning this game a priority from the start of the season. He recommended that his players spend their time preparing for the game rather than talking to the media this week, and has made it clear the stakes are high. 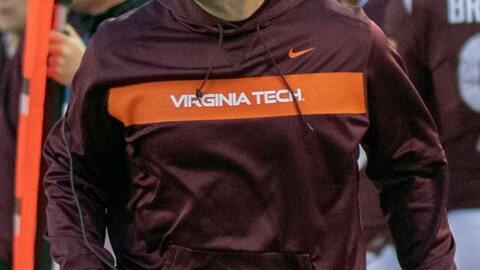 Teams that have not allowed Perkins to get much done in the running game have had the most success against Virginia, and the Hokies plan to try to keep him contained. The Cavaliers, meanwhile, while try to get receptions leader Olamide Zaccheaus involved early because his productivity opens things up for everyone else. The Hokies have outscored their opponents by 25 in the first half but have been outscored by 60 after halftime. Included in that is a 63-0 disadvantage in the third quarter of their four home losses. Virginia has outscored its foes by 56 in the first half and by 28 in the second half and overtime. For all its struggles, Virginia Tech remains one of the nation’s most efficient teams when driving inside its opponent’s 20 yard-line. The Hokies have scored on 27 of 30 such trips (90 percent) with 22 touchdowns (73 percent). Virginia has not been nearly as efficient, scoring on 34 of 45 trips (76 percent) with 23 touchdowns (51 percent). He missed a field goal in overtime last week in a loss to Georgia Tech, but Virginia’s Brian Delaney has given the Cavaliers a reliable field goal kicker for the first time in Mendenhall’s tenure. He’s made 11 of 14 attempts while the Hokies Brian Johnson has been a little less reliable, missing five times in his 12 attempts.